Nicaragua – officially, the Republic of Nicaragua (República de Nicaragua) – is a representative democratic republic. It’s the largest country in Central America, with an area of 130,000 km². The country is bordered by Honduras to the north and Costa Rica to the south. The Pacific Ocean lies to the west of the country, the Caribbean Sea to the east. Falling within the tropics, Nicaragua sits between 11 and 14 degrees north of the Equator, in the Northern Hemisphere. Nicaragua's capital city is Managua, with approximately one-fourth of Nicaraguans living there. Tourism in Nicaragua is currently the second largest industry in the nation. Baseball is their most popular sport. Boxing is the 2nd most popular. Tropical in lowlands, cooler in highlands. The weather during the dry months can be very hot in the Pacific lowlands. The Atlantic coast sees an occasional hurricane each season. In the past, these hurricanes have inflicted a lot of damage. Except in the central highlands, the climate is warm and humid. Average humidity in Managua in June, the most humid month, is 84%; in April, the driest month, 62%. Average temperatures vary according to altitude, between 20 and 30°C. There are two seasons: a wet season, from May to December, and a dry season, from January through April. Rainfall, however, varies according to region, and the rainy season in the eastern area may extend 9 or even 12 months. Temperatures are uniformly high—as is the relative humidity—and there is little seasonal variation. Temperatures range from 32°C during the daytime to 21°C in the evening practically year-round. Humidity is always high at about 80 percent. The rainy season takes place between October and November, and the best months to visit are mid-December and late March. Masaya is located in the Southwest of Nicaragua. The city is in the oriental slope of the inactive volcano, call also Masaya, of 913 m of height and to the west of the lagoon of the same name. Masaya is the cradle of the Nicaraguan folklore. Here poets and such musicians were born, as Alejandro Vega Matus among others. Lake Nicaragua or Cocibolca or Granada is a vast freshwater lake in Nicaragua of tectonic origin. It is the largest lake in Central America, the 19th largest lake in the world (by area) and the 9th largest in the Americas. The lake has a history of Caribbean pirates who assaulted nearby Granada on three occasions. Masaya is a shield volcano located 20 km south of Managua, Nicaragua. It is Nicaragua's first and largest National Park, and one of 78 protected areas of Nicaragua. The volcanic complex is composed of a nested set of calderas and craters, the largest of which is Las Sierras shield volcano and caldera. 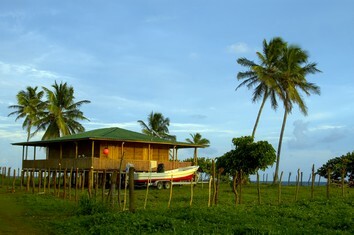 The Corn Islands are two islands about 70 km east off the Caribbean coast of Nicaragua, constituting one of 12 municipalities of the Región Autónoma del Atlántico Sur department. Corn Islands consists of Big Corn Island and Little Corn Island . Mount Pleasant Hill in the north of Big Corn Island, is the highest elevation of the islands. San Juan del Sur is the quintessential Nicaraguan fishing town: low-key and unhurried, yet sparkling with life. San Juan is a joyful merging of cultures, still uncrowded and drop-dead gorgeous, yet with enough American appetizers and air conditioners to make most foreigners happy. Selva Negra is a sustainable coffee plantation that welcomes tourists. From the food on the table in the lakeside restaurant to the electricity in the quaint half-timbered cabins, everything needed to run this little kingdom is produced at Selva Negra. Montelimar Nicaragua offers a holiday in a mild tropic climate on a beach full of activities and life. The beaches of Montelimar have four surfing breaks. Masa Chapa, Melon, Pochomil and Pochomil Viejo all offer fabulous surfing adventures. The private beaches, bungalows, hotels and resorts at Montelimar offer rich activities, great Nicaraguan seafood, music and wine. León is a department in northwestern Nicaragua . It is also the second largest city in Nicaragua, after Managua. It was founded by the Spaniards as Santiago de los Caballeros de León. León is also an important industrial, agricultural (sugar cane, cattle, peanut, plantain, sorghum) and commercial center for Nicaragua. The Caribbean Mosquito Coast (or Miskito Coast) historically consisted of an area along the Atlantic coast of present-day Nicaragua and Honduras. It was named after the local Miskito Indians and long dominated by British interests. The Mosquito Coast was incorporated into Nicaragua in 1894.